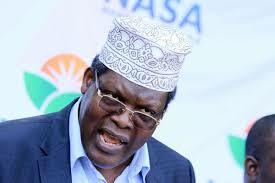 The National Resistance Movement (NRM) general Miguna Miguan is still persistent in his attacks on NRM leader Raila Odinga. In the recent of his series of attacks, Miguna took to Twitter on Sunday to mock Mr Odinga, hours after the former Prime Minister’s favourite team in the world cup Germany lost 0-1 to Mexico on Sunday. He linked the loss to the electoral process in the upcoming 2022 general election. Miguna, who was redeported to Canada in March, has in the past accused Mr Odinga of failing him in his journey to regain his Kenyan passport that was destroyed by police. On his first deportation, Mr Odinga was at JKIA airport to offer support, but his presence couldn’t stop the the lawyer from being bundled into a waiting plane. Following after Miguna’s deportation, Mr Odinga made the grand reconciliation handshake with President Uhuru Kenyatta, much to the chagrin of Miguna who has turned to be Mr Odinga’s fiercest critic. Today, @RailaOdinga's German team succumbed to the dexterous Mexicans at the #WorldCup2018. Before 2022, @RailaOdinga will be buried permanently by @UKenyatta after the March 9th surrender. Let those yelling at me start howling in pain. Patriots are marching on undeterred.